Once upon a time there was a small hole in a ground, also known as the MDRS, in Hobbiton just reachable over one main airlock. It will take travelers a long way to reach that little door in the hills and not many people dare to make that journey across the desert, therefore Hobbiton was left alone and isolated. The habitants of Hobbiton lived peacefully for a long time before the shadows reached them and all EVAs seemed to have a curse to them. Rumors rumbled in the underground and the powers of good in Middle Mars were wondering what curses begot these shadows. Frodo, aka Ghanim, who lived in the Shire of MDRS in Hobbiton, got a ring on Valentine’s Day and it seems something was whispering during the night. Gandalf aka Atilla, a Wizard from the South, was a good friend of Frodo’s and had secret knowledge of the ring and he knew to whom this ring belongs: Sauron a witch master from the dark times. He who seems to manipulate all EVAs from the fire mountain on North Ridge. It seems he built a ring to rule them all, one ring to bind them. This ring has to be destroyed. A secret meeting was held in MDRSshire and the Fellowship of Mars was formed. Together with Gandalf and master Elrond aka David, the powers of good of MDRS of Middle Mars, a mission was planned. Today the Fellowship of Mars woke up ready to leave the shire of Hobbiton. Four brave members of the Fellowship 205 dared to take that journey to conquer the fire mountain and to throw that ring into the fires where it was made so it cannot reach out with its power to Hobbiton and cancel more of our EVA’s. The four members of the Fellowship of Mars were: Dave aka Gimli, Daniel aka Legolas, Nathan aka Sam and Ghanim aka Frodo. They left at 0930 this morning to conquer the fire mountain: North Ridge and to throw that ring into the fires where it was made. Determined, they set off ready to face the devil that came from that mountain. With fast steps they reached the bottom of the mountain but half way up Frodo felt the burden of the ring. Sam stayed therefore with Frodo on the bottom to take more samples of that mountain to learn all about its geology to know what the Fellowship is dealing with. Gimli with his axe grew up in the mountains and Legolas with his elf feet could easily master the difficulties of the North Ridge. As the fastest of the group they decided at the end to go alone to make up the best way to bring Frodo and the ring up one day. Once they reached the top the other four members of the Fellowship: Arwen aka Veronica, Eowen aka Hannah, Tauriel aka Maria, and Galadriel aka Natalia, observed the Fellowship and their successful return. For the afternoon Arwen, Tauriel, Eowen and Galadriel had another mission to save Middle Mars. They wanted to take out the drone to take pictures of the land as there seemed to be another myth about a dragon in the mountains of kissing camels. The four girls of the Fellowship of Middle Mars were sent out to an observation mission. Arwen and Tauriel took Opportunity towards the mountains whereas Eowen and Galadriel took Spirit. Shortly after they left Hobbiton the EVA suit of Eowen had a problem which had to be fixed by Galadriel and Tauriel the two Elves of the group. Once they reached the Kissing camels Eowen as the experienced mountain girl from North Carolina, lead the group up the mountain for Arwen to fly the drone over the land of Middle Mars. Tauriel had the task to document the terrain with pictures. The rocks and the fog made it harder for the four to reach the summit, but after a while they found the secret path to take. Proud, they fulfilled their duty, they came back to the MDRSshire in Hobbiton to celebrate with mac and cheese, safe in the knowledge that the shadows are defeated for now. Narrative: After the first EVA (#08) came back safely and reported favourable ground conditions the second EVA of Sol 6 decided to go ahead as planned. The team began pre-EVA preparations at 1220, and entered the airlock for depressurisation at 1305. The team of 4 drove South East along Cow Dung Road away from the Hab towards Robert’s Rock Garden, using the rovers Spirit and Opportunity. During this travel H. Blackburn’s right breathing tube came out of the backpack (remaining connected to the helmet), so the team stopped to fix it and it remained in working condition for the rest of the EVA. Communications with the Hab was lost as they passed behind the ridge as expected. 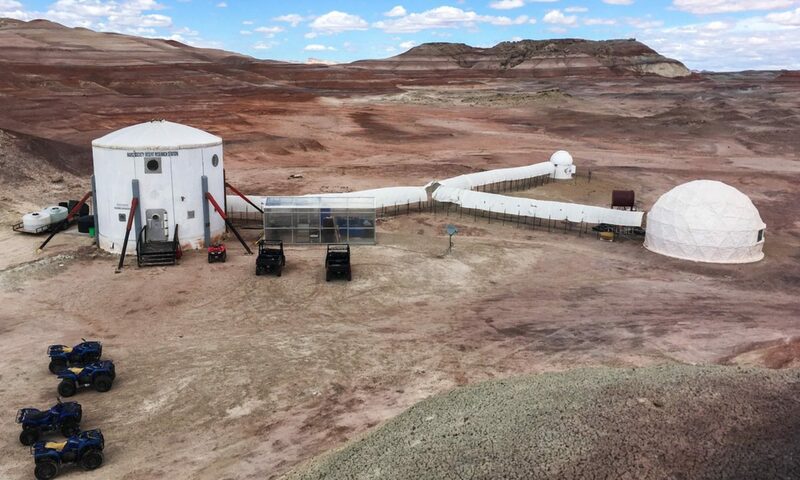 The team passed through Robert’s Rock Garden and parked on the South side of the Ridge, and here tested flying the drone in EVA suits to ensure its workability, which was successful if a little inaccurate in the wind. The team then walked back through the garden to ascend from the North side of the Ridge. This was done to re-establish and preserve comms with the Hab during the ascent which worked as planned. The team began their ascent at 1342. H. Blackburn’s radio battery died at 1345 so the team remained within shouting distance for safety, and the crew has discontinued its use. Soon after, the breathing tube on M. Grulich’s EVA backpack also detached in the same manner as H. Blackburn’s had earlier. Both suits have been set aside for work tonight to determine their usability. In addition, Grulich’s helmet had a problem, in that the indented “flap” became detached from the top of its join to the helmet and so was pressing down on her head and shoulders. Grulich didn’t notice this problem until the other team members inspected her suit when the breathing tube came out, so we are unable to determine a cause or time of malfunction. The helmet, in addition to the suit is set aside awaiting repairs. At 1407 the team reached the summit. While at the top they took photos for outreach and tested the drone along with its vertical camera capabilities. The drone had difficulty maintaining a stable position at the summit due to the increased wind, so the team decided to land it safely. The team noted that the South side descent appeared to be easier than their North side ascent, and so informed the Hab of their intent to climb down this way. The Hab acknowledged and wished them luck before the comms stopped as they went down the far side. The team reached the bottom safely and returned to Spirit and Opportunity and drove back towards the Hab at 1505. 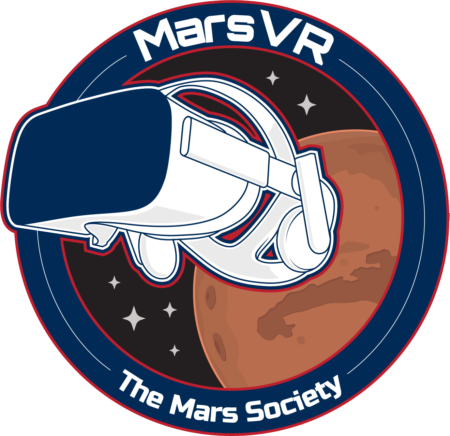 Having accomplished their mission objectives early, the team decided to stop at the Mars Society MDRS sign on Cow Dung Road south of the Hab, and take some photos together there too. They also use this opportunity for a final test flight of the drone and its camera. Again, the drone flight was hampered by the wind although some photos were taken. The team returned to the Hab airlock at 1535. Roads and routes per MDRS Map: South East on Cow Dung Road, parked Southside of Robert’s Rock Garden and walked North to South over Kissing Camel Ridge East before returning by rover to the Hab on Cow Dung Road again. Narrative: With the weather remaining favourable overnight and the ground being safe to walk on, it was decided that EVA 08 would go ahead as approved and planned. The team began pre-EVA preparations at 0845 hrs, and entered the airlock for depressurisation at 0923 hrs. The team of 4 headed North from the hab towards North Ridge and encountered no problems on the way to the foot of the cliff. A route, separate from 1103, was found up to the top of the ridge. The crew here decided to split into teams of 2 at around 0945, with one covering the lower areas of the cliff for sample marking, while the other completed the ascent to obtain samples from the top and take photos for outreach. Communications were maintained between both teams and the Hab, and the ascent was completed safely by 1011, by D. Masaitis and D. Robson. Two samples were taken from top of North Ridge, and the team at the bottom found a “rock garden” around the ESE of North Ridge at 0518790/4251422. This rock garden has been nicknamed “Hadland’s Garden”, after our GreenHab Officer and his dauntless quest for regolith and interesting rock samples. Once the operation on the top of North Ridge was completed, the team of 2 were guided down the slope by the ground team of N. Hadland and G. Alotaibi, who had already identified the safest route while sample location. The teams rejoined at the bottom of North Ridge safely at 1050. From here the full EVA team began taking samples from around the base of North Ridge and the newly identified rock garden area. 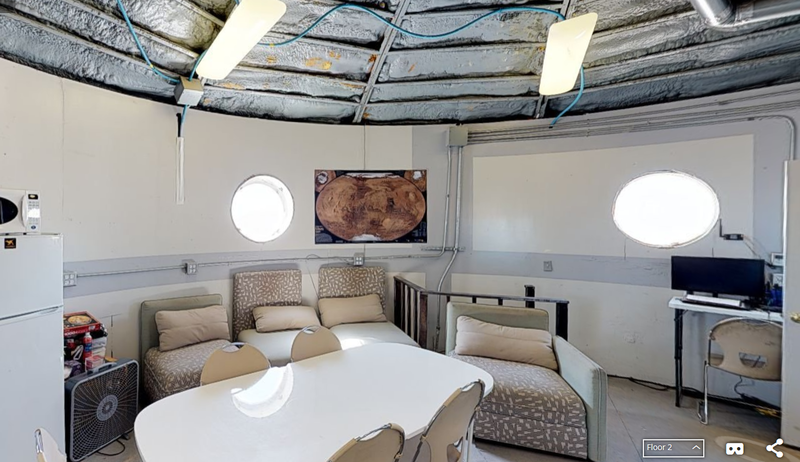 Sample collecting was finished by 1130, and the team returned to MDRS by 1141 for re-pressurisation. General notes and comments: No general notes. Summary of suits and radios: Suits 1 and 6 had right-hand air tubes disconnect at the backpack during EVA. The helmet accompanying Suit 6 also had a broken zip-tie on the back panel of the helmet. Suits 3 and 4 are having intermittent fan problems despite having correct battery voltage. These will be checked and repaired this evening and tomorrow by D. Masaitis and V. Trivino. One radio lost charge early on EVA, despite appearing to be at full charge prior to EVA. It was marked upon return, and will be thoroughly tested before being cleared for EVA use again. Summary of Hab operations: The lightbulb in the rear (tunnel-side) airlock is out. Crew requires a replacement light bulb in order to repair. The handle hardware of the front airlock interior door was loose. Crew Engineer tightened 7/8 screws, but the top-left screw of the top attachment point would not thread at all. Replacement benchstock required to make a successful repair. Summary of Science Dome operations: Hardware on the drawer set between the microscope table and laminar flow hood was excessively loose to where the drawer set was beinning to collapse. Repaired by tightening all of the hardware. Changes to crops: Some of the Arabidopsis seedlings died overnight due to the regolith drying out (see narrative). Damp paper towel germinations are starting to sprout. Narrative: Arabidopsis seedlings were transferred into collected regolith samples yesterday and watered with Hoagland’s hydroponic nutrient supplement. However, some of the regolith samples are exhibiting interesting wettability properties and appear to be absorbing the water at an extremely high rate, causing the samples to dry out quickly. After watering with approximately 5 mL per 15 mL of regolith substrate yesterday evening, the samples dried out by this morning and several of the experiments had died. We will transfer additional seedlings into the samples later this evening. The damp paper towel germinations are starting to sprout as well so we will have additional seedlings available for experiments. The digitized inventory of seeds as well as an inventory of the equipment available in the GreenHab and Science Dome is nearing completion and will be available to future crews prior to their rotations. More information will be available in the next Science Report. The cucumbers that we kept in their pots are looking healthier. However, the peas are not improving and the crew will continue to keep an eye on their progress. The door was opened at 1100 hours for ambient airflow and closed at 1530 hours to prevent dramatic climate shifts. Sol activity summary: Unsure on whether the weather would permit today’s EVAs given last night’s warning of a high chance of rain and wind, crew 205 was pleasantly surprised to wake up to a sunny morning, which remained clear throughout the day, permitting both planned EVAs. The morning EVA’s crew was composed by the four men of crew 205 who went up to North Ridge and its surrounding foothills to collect samples. The four ladies used the morning to make "Kaiserschmarrn" (scrambled pancakes), write up documentation, and of course act as capcom to our bearded crew members. The girls’ EVA consisted on a drive to Kissing Camel in order to take drone footage at high altitude (and sneak in a "Charlie’s Angels" pose photo). After returning from the afternoon EVA (to a fresh pot of coffee made by the guys), we worked on writing our documentation and planning tomorrow’s EVAs. In the evening, the long-haired girls will have our once-every-3-day-super-water-efficient hair wash session which we always look forward too! Look ahead plan: We have two EVAs planned for tomorrow, a 4-hour morning one to "The Moon" and an shorter afternoon one to Hab ridge. Other than that, tomorrow’s HSO (Dave) and myself (tomorrow’s engineer) will be working on fixing some of the spacesuits, and the journalist wants to continue filming her interviews of the crew.